Summertime is here, and for most of the country that means it’s bound to rain. To prove our point, it’s raining here in Michigan while we write this. 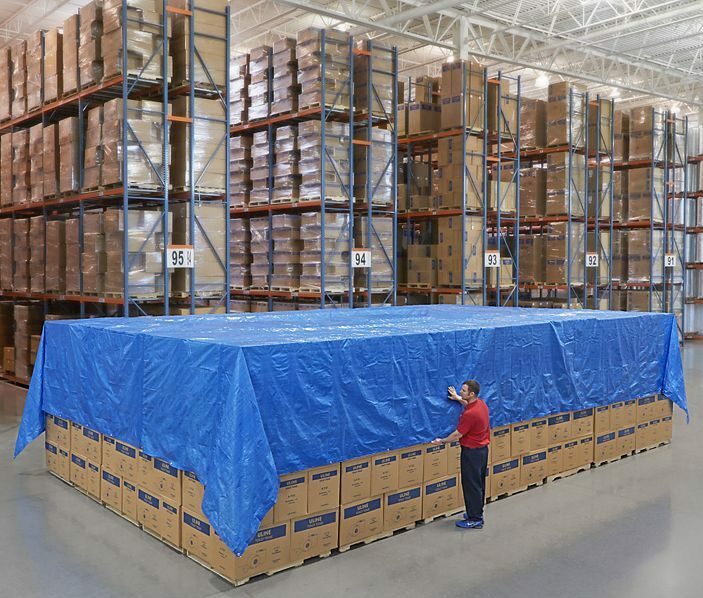 Get tarps for everything: A lot of warehouses simply don’t have the space (or shelving) to store their pallets indoors during rainfall, and while it isn’t a good permanent solution there is something you can do—provide enough tarps to cover any inbound pallet during its trip between the truck and the inside of the warehouse, and make sure to never leave anything outdoors longer than needed. Waterproof storage solutions: If your items take a longer trip between the dock and the warehouse than you’d like, a proactive solution is to invest in waterproof storage options. Get some rust-proof wire shelving to hang onto items without fear of corrosion or damage, invest in waterproof storage boxes whenever possible, and try to talk to your supply chain partners about sealing any incoming packages to prevent water damage. Provide shelter: If your packages need to be stored outdoors for longer periods, it might be the right time to consider some warehouse renovations to protect your goods. If you can’t afford a fully-indoor storage space for your building, at least try to add a warehouse mezzanine to add extra coverage for your incoming products. Rotate picking orders: A good and inexpensive way to minimize exposure to the elements is to prioritize certain items over others. If the easier-to-transport, more weather-resistant, or better-packaged items are carried in first, you can reduce the amount of time the more vulnerable items are left out in the rain and help establish a better flow for items overall, particularly if this helps balance your FIFO output. With these tips and a little careful planning, your warehouse will (hopefully) never have to deal with a pile of soggy cardboard boxes again.